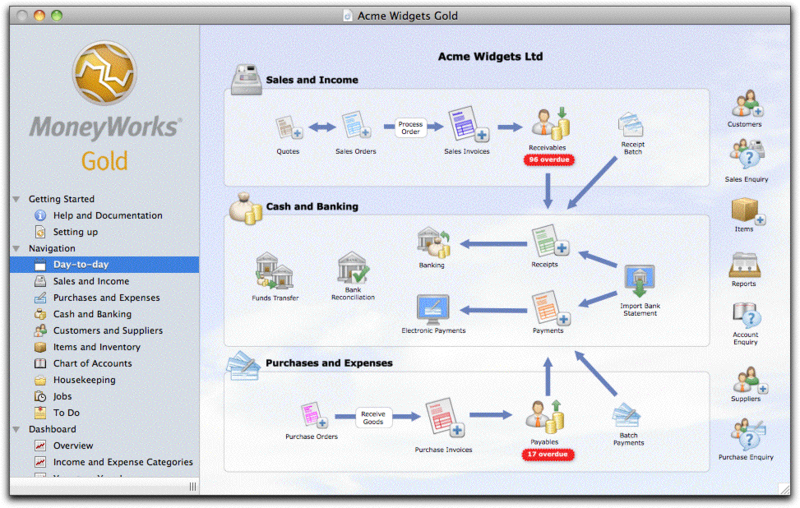 The MoneyWorks Navigator window provides visual access to most of the functions within MoneyWorks, as well as “live” information such as overdue receivables and specific dashboard information. Because common workflows are presented in pictorial format, the Navigator is an ideal way for new users to find their way around the program. However it replicates the menu commands, and in general the more experienced user will find it faster to bypass the Navigator and use the menu commands with their associated keyboard short-cuts1. The Navigator groups operations into functional areas in a graphical window. This window cannot be closed (but it can be resized). The functions available depend on which version you are using—MoneyWorks Cashbook for example will not have functions for invoices. The standard Navigator consists of three main sections, shown in the sidebar. Getting Started: Contains links to MoneyWorks help and documentation, and a visual guide to setting up your new MoneyWorks file. 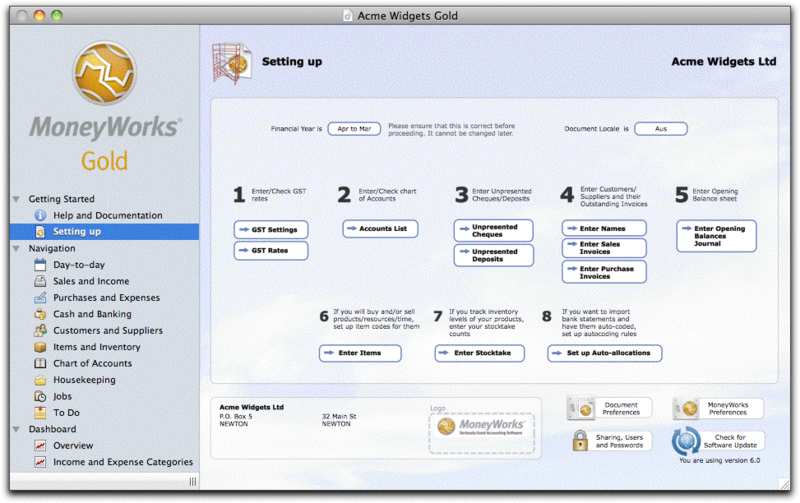 The Panel above is the “Setting Up” panel in MoneyWorks Gold, and provides a checklist of steps to follow when setting up a new file. This is shown when you create a new file. Tip: Once you have finished setting up, close the Getting Started section by clicking on the disclosure control to the left of the section name. Navigation: Contains flowcharts of typical business workflows. There is a lot of redundancy in the design (i.e. functions may be repeated on more than one panel), making access easier. The panel above is the Day-to-Day panel in MoneyWorks Gold. This covers most of the core functions of a typical business, and is complemented by other more detailed panels, so (for example) a user who is solely concerned with payables will probably use the more specialised Purchases and Expenses panel. Dashboard: Contains summary (dashboard) information about your company. This is a realtime snapshot of your current position. 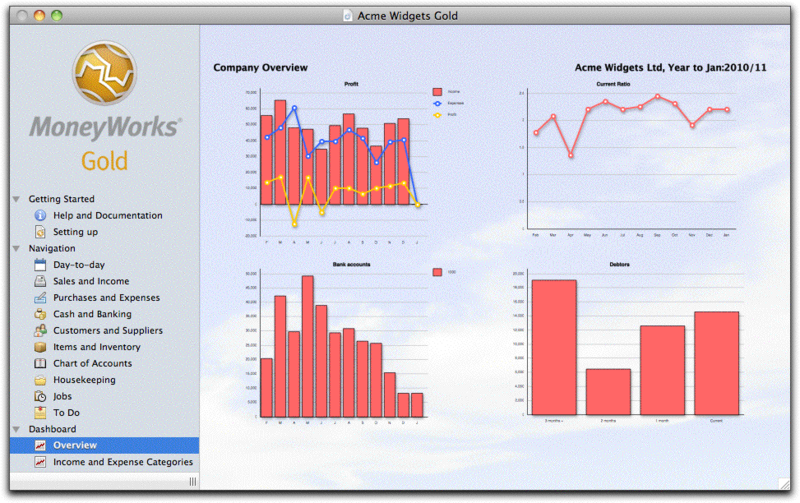 The Overview panel above is for the Acme Widgets Gold file. At a glance it can be seen that they are approaching an imminent cashflow crisis (the declining bank balance, bottom left), possibly caused by poor management of their Receivables (bottom right).